crop, rotate 180, NI, curves, resize, NI, USM. The fish tank makes yet another appearance. I held the bulb underwater with my left hand and shot the pic with my right hand, with some help from a tripod. I put yellow paper under the tank, and curled cyan paper very loosely around the tank. One strong light from above. Wow, thanks everyone for all the comments and votes, you've made my year! This shot is a winner! Congratulations. that is such a cool shot! so creative! did I tell you how cool I thought this was? Whoops - my oversight. Congrats on your ribbon. Very well deserved! Excellent idea and great outcome. Congrats on the ribbon! a superb idea and a great shot, first ribbon with an amazing score...you killed us all! Cool shot. Awesome score. Congrats on your ribbon. The second highest score with that camera. You must be stoked with that. Slippy this is a well earned ribbon, if there were one person here I would have liked to see get a ribbon it would be you, congrats! I should add you as a favorite. Congrats on the ribbon Strikeslip. Knew this would be up there. 10 from me. Heya Slippy! Muchos Congrats to you for your first OVER-DUE ribbon!!! and a huge 7+ !!! Excellent execution!! Wow! Another great image! Great shot! I knew this one would be in the top three, congratulations! Added to my favorites. Congrats on your first ribbon mista Slip! Congrats on the ribbon slippie!!! Seriously though, only a 7.7? You can do better :). Message edited by author 2006-07-06 15:02:11. Very clever and well performed. The creativity of the concept, the simplicity, and the superb lighting and composition make this a worthy winner. Congratulations on this excellent shot and your well deserved ribbon. Creativity at its best! Congratulations on a fine photo and a respectable finish. WOOHOO!!!! Awesome shot and big congrats on the ribbon!!!!!! woww good idea and great shot with great score!!!! Woah man, congrats on the first ribbon! Very well deserved! Woohoo - congratulations on the first ribbon!!! Awesome shot and great score too. congratulations on your first ribbon with this Wonderfull, creative and well executed shot!! Congratulations. This was my personal fave of the ribbon winners. I had no idea it was rotated. Remarkable shot..well done, and congrats on the ribbon! Woohoo big congratulations Slippy!!! You really deserve this long-awaited ribbon!!! Congratulations on your first ribbon! Excellent shot! Hey, WOW! Slippy got a ribbon! Way to go, dude! Congrats man!!! That is an awesome shot. Great score and well deserving. WTG Slippy! Congrats on your first ribbon! Great idea, execution colour and lighting.! wow ... i'm deffinetly going to get a fish tank ..
Beautiful and a hardy congrats!!! Poor guy, you were so nervous.lol. I hope all the jitters are gone! huge congrats slippy...this is just your week! great image and very well deserved! Nothing under a 4! Color me impressed. congrats on your first ribbon (and 7.6 score!)!! AWESOME!!!!!!!! Congratulations on your first ribbon!! I'm so glad this won! Truly a masterpeice (of sorts) :). Sweet ~ very clever!! Congrats!! Way to go! Congrats on your first ribbon! And what a killer score, too! wtg Slippy!! Congrats on your first ribbon!! Very nice Slippy. Congrats on the Ribbon! Hey, did your head explode as you said it would? I hope not so we can see more from you. Congratulations! Way to go! Greatly executed. I missed this one somehow while voting but congrats on your ribbon. WOOHOO! First ribbon for the master of mirth! Well deserved and very well executed. Bravo. holy smokes, what a shot!! w2g slippy! look at all those 1s, 2s, & 3s!!! Whooot!!! WTG Slippy!! Congrats on your well deserved ribbon. This is one seriously fantastic image! Really glad you placed second, becuase I've never gotten third before, oh, and excellent job on this well done photo! Dayum! Slippy! Yer photography is getting too serious. ;-) Congratulations - a fantastic shot! Stunning shot. Congrats on your red ribbon. D00d! Ribbon magic baby :) I called it first Slippy! A ribbon and that elusive 7+ score!!! Hope you're celebrating!! Congrats this is a great shot. w00t! Congrats on your first ribbon Slippy! Great idea. I'm really impressed on how you did this one. I had it pegged to ribbon. So cool, well deserved 1st ribbon. Great shot! Glad to see you finally came home with the ribbon! OMG! You nailed it! Congrats on a great image Slippy. I'm so happy for you. Was it worth the damage to your nerves? ;) Congrats! Just about 7.70 and second place! I don't believe it. Man, you'll have to complain to management about this. Woo hoo!!! YAY Slippy!!! Congrats! Brilliant, Slippy! Was wondering how you did! Big congrats on your first ribbon and a big Hurrrrrrrrrraayyyyyyyyyyy!!!!!! Wow, this photo is a stunning achievement. Way to go Slippy!! Yeeehaaaa!! Congrats on the ribbon!! I get it! What a fun concept and setup. Would've been perfectly in tune with the title if the light filament was a glow, a real thinker on how to set that one up though ;) Great shot! Pretty funky shot. Looking forward to seeing how you set it up. Bumping up. This shot certainly has some wow factors. I love the colors and the smooth lines of the glass and liquid. Very nice shot. Hope you share how you did this. This is my absolute favourite in the entire challenge. It's perfect! Well, ok.. perfect except for that white dot in the water.. on the left. ;P But yes, wonderful work. I really like this one! Great concept, well executed. I love the use of colour, and the reflection in both the glass and the water surface. Lighting is masterful - I think the lower lighting on the fingers works well. This is just the sort of "ideas" shot that I love finding on this site. 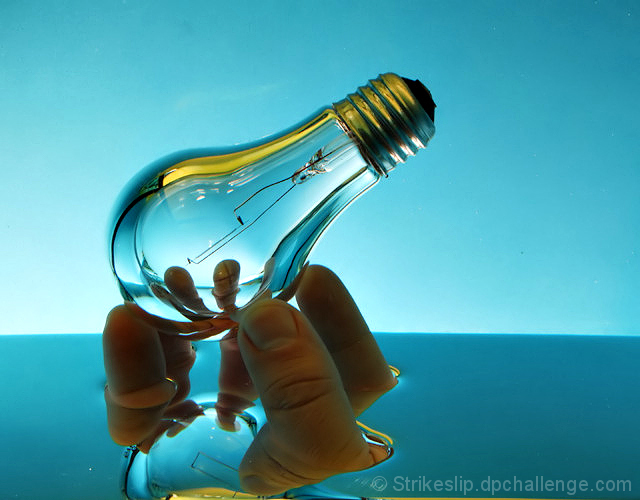 My favorite of the light bulb shots in this challenge. Am interested to see how this was set up. amazing creativity! Very nice work! This doesn't even need to be said, but I'm looking at a ribbon winner here! The vision in this shot is beautiful... I love the creativity of your subject selection and presentation. awesome! hope this does well! im looking fwd to reading your commentary after voting. Interesting concept and I like the blue cast. I've only voted on 8% but this is the definite winner so far. Nice job. This is in my opinion the best photo in this challenge. I look forward to seeing this on the front page next week! Love the multiple refelctions. The bulb is also very crisp. Nice. this one is quite cool. 8. Ok this is a ribbon! Great job. Seems like the water level in the aquarium wasn`t level enough :) But what a clear crisp image! Interesting! Color tones work well, even if the fingers seem a bit dark. Looks like something Scalvert would think up. I always thought water and electricity didn't mix well. This photo has proven me wrong. Perfect contrast. Pretty cool shot witht the scene repeated in the lamp. Nice blue tones. Very cool. Look forward to reading how you did this. Well done. the colors are nice and clear. unusual take on the challenge. I think this will be one of the winners. It's original and very well photographed. damn that's nifty. I predict a ribbon (even though I'm always wrong). Crisp, super-clean photo using a reliably impressive technique. The purpose of it escapes me for now (apart from being satisfying eye candy) but what the heck. Nice clean inverted image. I'd be included to try it sideways. 8. Pretty cool shot, nothing that rivals Kiwinesses "Zero spot editing" image but it´s enough for a 7 from me. Nice sharpness on the glass. The fingers through the glass look good. Nice colors. Only nitpick is that the skin looks a bit yellow. I still really like it. I've always loved the idea to photograph a subject like this (upside down in a aquarium) you did great, but I think I'd crop the yellow line at the bottom. Interesting. Mysterious. I bumped it up a point while looking at it the third time. ;) Nice. This looks like it was shot in a fish tank then the image was flipped. I don't know if that is allowed. What is that liquid and how did you get it to stay so still? Awesome shot! Too bad the liquid around the hand is not totally smooth. Beautiful rendering on the lightbulb. Proudly hosted by Sargasso Networks. Current Server Time: 04/20/2019 08:12:32 PM EDT.